Every time when I encounter an issue – I think a lot about the issue, lose time, undergo lot of emotional change till I finish it. Once I move it out of my plate, I feel happy and wish not to get a issue like this in my life. But issues in life is not having any end to it and the cycle continues. Today I decided to write my thoughts about issue. Issue is something you feel disruptive when you expected to lead the life in defined routine. 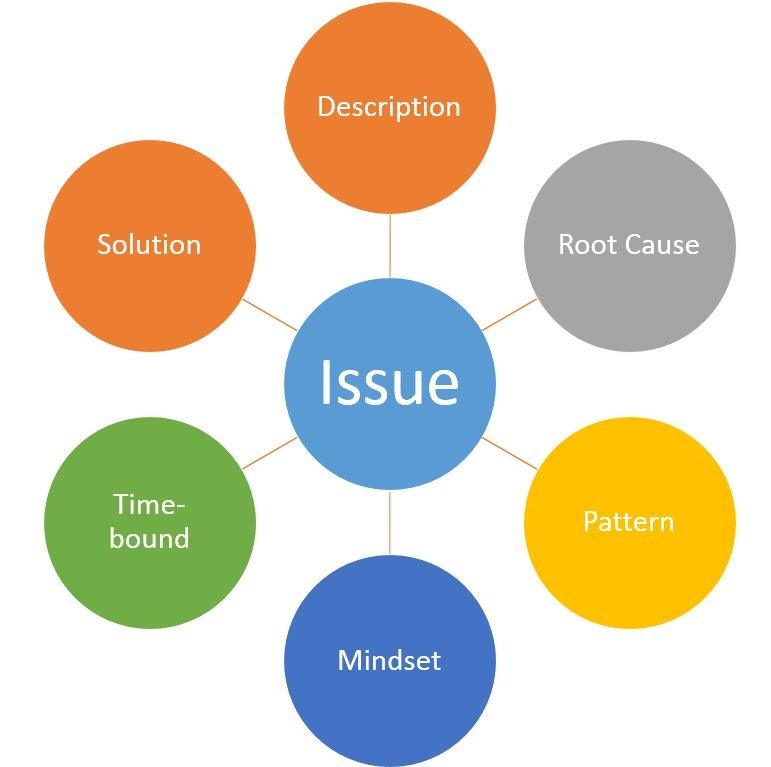 An issue has a description, root cause, pattern, mindset, its time bound and have solution. Here is a single line explanation about each of those components. 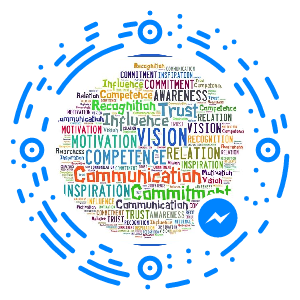 This is Infographics representation of one of my blog post “How do we practice transformational leadership in facebook?“. This is my first attempt in creating the Infographics format. I see Infographics uses some of the components of Mind Mapping for its attractiveness – more graphics with highlighted keywords. Here is the Management & Leadership topics list that I used to categorize & generate ideas. You can see all these topics in any Self-Help/ Management/ Leadership book. If you take a closer look at the image Leadership Rubik’s cube which is the theme of this blog, I used 9 topics from the list to build it. Here is what you can do with this list – Just take one (and only one) topic, generate at least 4 synonyms for each of those – think what idea you have about that particular item. Each one of us have general idea about each of the item listed. The more you dwell on one topic, you develop new ideas on those & you will become the master. Aristotle once said. "We are what we repeatedly do . . . Excellence, then, is not an act, but a habit." If I post this question to you "Why are you working so hard in learning all things about your domain? What do you want to achieve in your domain?" Most of you will say "I want to achieve Excellence in my area. That’s why I am putting so much effort." Studies have shown that the most important way to achieve excellent performance in fields such as sport, music, professions and scholarship is to practice. Achievement of excellence in such fields commonly requires approximately 10 years of dedication, comprising about 10,000 hours of effort. "When the country is in kiosk, everyone has a plan to fix it, but it takes a leader of real understanding to straighten things out" . Because Leaders possess Excellence – talent in understanding the problem & provides solution that brings out a country from the issues. Leaders have vision – they dream more than others think is practical. Success is a by-product of Excellence, not the means to its own end. So.. Pursue Excellence.. Ignore Success. I will present some Agile terms & explanations in this post. Before getting into explanation, let us review couple of important questions. Question: I know all tools, processes & familiar with practices of Agile methods. Can I go ahead and follow Agile in my Project today? Answer: Nope. Agile is more than just mere practices & terminologies. Agile is a mindset. It requires a change in work culture which boils down to organization culture. Agile advocates bringing people together in single platform (by a shift in the mindset) than just following the defined processes. Agile is flexible in terms of processes, tools and you are free to customize/tailor-made them based on your project need. But it is requires constant interaction & collaboration between people with mindset to deliver value to customer through developing usable working software. That is the complex part everyone forgets to appreciate in early stages of Agile adaption & struggle with failures later on. Question:Why Agile is a great phenomenon you should follow in current economic trend? What is the work plan for today? What are the obstacles exist? All answers should focus on status based user story and no general discussions. “User Story” is Scrum term for user requirements. It has short descriptions of user/customer valued functionality that is used for planning & act as reminders to have conversations with customers. A user story generally has 3 sections: <Who>, <What>, <Why> of a functionality. Example: As a <Who:Manager> I need to <What:view orders submitted to me> So that <Why:I can take action on those very fast>. User story can hold short test descriptions that can be used to decide whether story is done. User stories are written in a card that is size of sticky notes, so it needs to have a phrase or two that act as reminders to hold the conversation & notes about issues to be resolved during the conversation. If required, team can use backside of the story card to list testing related notes. (I)ndependent – No dependency with other stories so that it can be executed in any order & can be prioritized based on value to the organization. (N)egotiable – User stories are functional requirements in business terms but they are not contractual agreements. Details can be negotiated & modified in a dialogue between customer and dev team. (V)aluable– Understanding value of a functionality is useful in prioritizing & delivering top features during initial iterations. Value of user story captured insection. (E)stimatable – Developers need to come up with time to complete each user story, so it should be estimatable. (S)mall – User story needs to be small enough so that it can be accommodated in an iteration. Big user stories are called ‘Epics’ that may contain a 1) complex user story 2) compound (multiple) user story. Epics can be divided into multiple smaller independent user stories. (T)estable – User stories should contain information with which test cases can be generated without much confusion & decision of done can be arrived. 1. The user cannot decompose a story into more end-to-end stories, meaning stories that touch all the layers of the application. 2. The team can derive tasks, ranging from 4 to 8 hours, to start their development work. There are many ways to help verify that the requirements are well written, above we saw INVEST rules for user stories. Another one is known as the CUTFITrules, which we used extensively to help validate the user stories. (C)onsistent: A consistent requirement does not conflict with another requirement. (U)nambiguous:The reviewers of a requirement statement should be able to draw only one interpretation of it, regardless of their role. (T)estable: We should be able to create test cases for a requirement. If a requirement is not testable, trying to determine whether it is correctly implemented is a matter of opinion. (F)easible: It must be possible to implement each requirement within the known capabilities and limitations of the system environment. (I)ndependent: No “user story” should be dependent on another “user story”. (T)raceable: You should be able to link each requirement to a user and to his goals. “Sprint” is Scrum iteration time length(typically 1 – 4 weeks) in which development team work on certain prioritized set of backlog items and produce some tangible value to the customer. Sprints are time-boxed & should have same length throughout till the final product delivery. Generally, no scope change is allowed within a sprint but modification user story can be prioritized and included in subsequent sprints. * As Agile focuses on delivering value to customer, timeboxing compels prioritization of work that in turn increases focus. * Whatever be the status of user stories, sprint comes to end exactly on timeboxed end date, so team focuses on completing all user stories planned for the sprint otherwise it will be added to next sprint. * As number of items taken in hand (# of user stories) are limited in a sprint so items under development status will also be in limited number. User stories are planned either by number of days or story points. If total product backlog measured as 150 story points & each Sprint length is determined as 30 story points (based on team’s comfort-ability in delivering the potentially shippable product increment), then there will be 5 Sprints/iterations (5 Sprints * 30 story points) for product completion. User stories that add up to 30 story points can only be planned in one sprint. At the end of each sprint, goal set for the sprint is achieved based on agreed definition of done. One can give a day long lecture about “Product Backlog” as it is the heart of the Scrum framework. Let me put concise explanation about it. functionality, defect, technical improvements or even knowledge acquisition (prototype or POC development). Most PBIs are features – items of functionality that will have tangible value to the user or customer.A good product backlog should have DEEP attributes. Roman Pichler, and Mike Cohn use the acronym DEEP to summarize key attributes of a good product backlog. (D)etailed Appropriately:User stories on the product backlog that will be done soon need to be sufficiently well understood that they can be completed in the coming sprint. Stories that will not be developed for a while should be described with less detail. (E)stimated: The product backlog is more than a list of all work to be done; it is also a useful planning tool. Because items further down the backlog are not as well understood (yet), the estimates associated with them will be less precise than estimates given items at the top. (E)mergent: A product backlog is not static. It will change over time. As more is learned, user stories on the product backlog will be added, removed, or re-prioritized. (P)rioritized: The product backlog should be sorted with the most valuable items at the top and the least valuable at the bottom. By always working in priority order, the team is able to maximize the value of the product or system being developed. Defining & documenting product backlog item is called Grooming. Amount of work in a product backlog is executed in multiple iterations called Sprint & sprint backlog is created with subset of high-priority items in the product backlog. At the end of a sprint, in case any item is still pending or new items found they will be inserted into product backlog in the correct order to be worked on in a future iteration. Learning is easy when you develop an analogy with known & easy to remember items.Here is an analogy that you will remember for life about Agile methods. Agile is like reading your school text-book. Yes! Let us go back to your school days. Start of the year, Teacher provides you a text-book (say Science subject) that have 12 chapters totaling 400 pages!!! If teacher ask you to study the whole text-book and write exam at the end of the year how do you feel? You may feel it will be very difficult, boring & you keep the book always in hand but don’t think you studied all content. Take this way – Teacher says ‘Each chapter is around 35 pages long. I am going to cover one chapter for every 15 days. End of each chapter, I will test you with questions taken only from that one chapter. We will follow this method till we complete all 12 chapters.” Will it not give you entirely different feel? One clever student asked “Pages for each chapter differs in that case what do we do madam?” Teacher told “You are right. Okay. Based on chapter size, we will make it 10 (for small chapter), 15 (for average chapter) and 20 (for big chapter) days. Suppose she goes ahead and say ” We are not going to go in same chapter order. I will cover all important chapters first and then we cover other chapters.” That make your reading even more interesting. Right? So, after 6 months time, where you will be? You are done with reading & understanding the entire text-book content!!! Agile is methodology that is based an iterative, incremental software development processes. A group of methods implements Agile principles out of which one is called Scrum. Let me restrict my analogy to Scrum method. Book reading explained above is also an iterative, incremental process where we are performing study of whole book in given time period. With this analogy I hope you get fair idea about Scrum terms & its usage. Yes. Whether ‘To communicate’ with someone about something OR ‘Not To Communicate’ is your choice. Mindset – The factor that really decides the choice we choose at a given point of time. Mindset is nothing but ‘Set Mind’. Our brain has a wonderful ability to train and make decisions based on prior experiences. From birth our mind forms cognitive patterns based on information consumed through sensory organs. All those forms of communication signals is then converted into ideas and stored. This process happens every second and even in this process every human develops unique idea about communication & its components also. Everyone of us have our own definition for questions like – what is good communication? what is bad communication? who are all good/bad communicator in my scale? Whom I want to show as my examples? etc. We show our idea about communication in every communication opportunity we encounter and even train (or fine tune) our ideas based on outcome of current opportunity. At one point of time in life, when we learn our communication is bad, we don’t really take the comments as it is. We try to defend with all our reasoning which I listed earlier post under myths & reasons that ruin communication development. By the way, removing all negative reasoning in mind with positive reasons in one complete stretch is not possible – but it is possible in step-by-step way. Training of ones own mind & forming an idea (or pattern) requires long time, but once idea formed it is really long time to break that out. That’s why mindset can be termed as ‘Set Mind’. Getting proper mindset is essential for communication. Now, the main question from you is “So what do you want me to do now?” Here I give just 4 pointers. 1. Rewrite your definition of communication in mind – To rewrite definition of communication, first you need to recollect what do you think about communication, purpose of communication, good and bad communications, different situations you come across in life, outcome of communication opportunity, your fears, your earlier victories, whom do you think good communicator and why. After recollection, write down which are all thing you do different from what you think as good communication – in this step try not to satisfy your mind by giving some reasoning for the deviation between what you think good and what you did as it may take you back to old state only. Remove the myths and restating the purpose of communication often will make the whole process of easing your set mind. 2. Work on deviations – What are you deviations? To you what you want to achieve and what you are currently doing. Main item here are – stage fear and fear due to status difference between you and people whom you like to interact. Most of the self help book on communication talks about it & most of its content deals around anyone of this – rehearsal, boosting confidence by seeing yourself in mirror, correct outfit, eye contact, body language (non verbal), making impact using different tones & powerful words (verbal), don’t be anxious, etc. 3. Make a best choice & right choice – One of the outcome of communication is ‘relationship’. Basic necessity of human race is living in a community which has foundation as good relationship with others. So making right & best choice in every communication opportunity is very important. Communication is like a two-sided sword. Balancing your communication at a given situation is very important to increase your success. Many time our choice not to communicate causes misunderstanding & even spoiled a great opportunity. On the other side, over communicating also create issues. One needs to know when to start when to stop – what to share what not to share. All these comes through experience and need to be consciously controlled by mind. 4. Don’t stop, repeat – If you felt your choice in previous opportunity was bad, don’t stop and stamp yourself as ‘Bad Communicator of the world’. Just go back to step 1 and rewrite your definition once again – work on your difference. Okay – if you felt your choice in previous opportunity is good, don’t stop there you need to repeat the same thing again and again in every opportunity as it gives you right result.